How long must your banana be? Well, according to the current EU regulation, anything shorter than 14 cm is unworthy of sale. (I’ll save you all the conversion…that’s 5.5 mushy inches.) Pears are a different story. They must have perfect skin free of all blemishes in order to be deemed good enough for European markets. Okay, what happens to the rejects? Approximately 20 percent of farm produce in Europe goes to waste because it is not pretty enough. 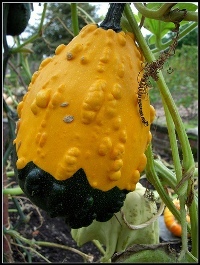 Organic farmers, such as Patrick Holden of west Wales, have had their produce rejected for ridiculous reasons unrelated to safety, including being too knobbly, small, or curvy. Who doesn’t want a curvy cucumber? While 26 fruits and vegetables may be freed from future landfills today, 10 others, including bananas, apples, and tomatoes will still have to obey the rules of perfection. Am I the only mother who would pay more for a bunch of child-sized half bananas? What is wrong with this world? Next time your kids are getting impatient on your grocery run, why not challenge them to find the ugliest fruit and vegetable they can. By the way, this morning on Toronto’s Breakfast Television my kids and I learned that the original colour of the carrot was not orange. The wild carrot (not so tasty apparently) was experimented with until it matched the Dutch royalty colours. Leave a comment if you think you know what the original carrot colour was. No Googling! Image: flikr user karenwithak under a Creative Commons license. I believe such produce can at least be sold locally (which is the bulk of business for organic farmers anyway, no?). I live in the EU and see all kinds of funky-looking and “blemished” produce for sale. I’m glad to hear that organic farmers were selling their unbeautiful goods locally in your area despite the ridiculous restrictions. The ruling went through to lift some of the restrictions this week (http://news.bbc.co.uk/2/hi/europe/7723808.stm ), but it’s still hard to believe that a banana still has to be so long. Save Energy and a Whole Lot More By Turning Off the T.V.